Motor imagery is useful for motor rehabilitation. Using mental chronometry (MC), this study assessed the effectiveness of tool holding on imagination/execution (I/E) time ratios during motor imagery tasks. Forty-eight healthy right-handed adults performed two tasks: holding a pen and not holding a pen while imagining the movement involved in writing the letters of the alphabet from A through J. When using their preferred right hands, the I/E time ratios were significantly lower when imagining writing while actually holding the pen than when not. The I/E time ratios were similar between the two conditions when the participants used their non-preferred left hands. These results suggest that the use of a tool can impact brain function. Further, tool use may affect the rehabilitation process, as tools are incorporated into the body schema during motor imagery of an automated tool-use task. This kind of test does not require strict motion restriction as do more cumbersome methodologies, such as brain imaging. As a result, MC can be used with patients in a sitting position in a great variety of environments where rehabilitation is widely practiced. Motor imagery is the process of simulating movement mentally without physical execution of the movement . This mental practice of motor imagery is being considered as a technique for improving performance during rehabilitation for motor recovery [2–6]. It is often difficult for us to objectively evaluate motor imagery because it is only a mental representation of the movement. However, it is possible to visualize brain activity during motor imagery using neuroimaging techniques. Studies that use positron emission tomography (PET), functional magnetic resonance imaging (fMRI), or near-infrared spectroscopy (NIRS) are capable of detecting common neural networks involved in both motor imagery and real movement [7–15]. Recently, motor imagery has enabled us to practice brain-computer interface rehabilitation [16,17]. The same brain regions are active during motor imagery as are during movement execution, including the premotor area, the pre-supplementary and supplementary motor areas, the primary motor area, the primary somatesthetic area, and the superior and inferior parietal lobules . The inferior parietal lobule, in particular, takes on the role of both integrating information from a variety of sensory modalities, such as the visual or somatosensory systems, and forming the “body schema.” The body schema is defined as a posture model that is constantly modified by changes in posture . The body schema is generated by interactions of the body with the environment, which plays an important role in incorporating the use of tools into the body schema . This interaction with the environment, including tool use, is also important to produce a clearer image of motor action. Motor imagery is based on the body schema. Some studies reported an association between motor imagery and tool use [21–24]. However, these subjects were mainly badminton players; few studies of routine tool use exist [22–24]. Mizuguchi et al. reported that the excitability of the corticospinal tract during the motor imagery of using an object was reinforced by actually touching the real object . We assumed that the motor imagery became clearer when performing the act of holding a tool, as seen in the case of exercise with a tool. Mental chronometry (MC) is a method that measures the time required to imagine a task without execution, and it is one of the indexes used to objectively assess motor imagery ability . MC is also a simple tool that can be used on a regular basis to monitor the capacity of subjects to reproduce mental tasks during motor imagery practice . In studies using MC in healthy subjects, similar actual and imagined movement durations or under- or overestimation of actual movement durations during motor imagery were found . MC-related findings have been utilized to evaluate and examine intervention plans and as a means and to judge intervention outcomes in rehabilitation, which is widely used in a variety of circumstances. MC is of significant benefit for these purposes. Few studies have focused on the use of MC to assess the differences in imagination/execution (I/E) time ratios during motor imagery in the presence or absence of holding a routinely used tool in healthy subjects. Consequently, the purpose of the present study was to assess the I/E time ratios in two tasks: imagining the movement of writing the letters of the alphabet while holding a pen and without holding a pen. Forty-eight healthy right-handed volunteers (19 females; 29 males; average age ± standard deviation = 22.8 ± 2.7 years) participated in the study. The participants were recruited from university students and staffs for this study. No subject had a history of any neurological or psychiatric disorder. Handedness was assessed by means of the Edinburgh Inventory . Informed written consent was given by all the participants, and the study was approved by the institutional ethics committee of the International University of Health and Welfare. We asked the subjects to perform tasks: 1 execution task and 2 imagination tasks. These tasks involved writing the letters of the alphabet . The participants were asked to write the letters of the alphabet from A through J on a sheet of paper with a pen at a normal speed. With closed eyes, the subjects imagined the movement of using a pen to write the same letters of the alphabet, either while actually holding a pen (with tool condition) or while not holding the pen (no tool condition) (Figure 1). In the with tool condition, they held the pen in the same way as they would have during actual writing. In the no tool condition, they held their fingers in a position as close as possible to that of actual writing. In both imagination conditions, the subjects were instructed not to contract their muscles as if writing, but only to allow the pen to rest in their fingers and to picture themselves kinesthetically performing the writing movement. They performed the tasks while sitting in front of a table. The time during the execution task was recorded by the authors but the time during the two imagination tasks were determined by each subject. The moment when the nib of the pen touched a paper to write A and was taken as the beginning. The moment when the nib left the paper to finish writing J was taken as the end. The order of with tool condition and no tool condition was random. The participants performed the tasks with their right hands at first and then performed with their left hands. Each task was repeated for three trials. Figure 1. Hand positions during the writing imagery task. (a) No tool condition. (b) With tool condition. The mean duration of the three trials in each task was measured for each hand. The I/E time ratios were calculated to quantify the temporal congruence between the two conditions; the no tool and with tool conditions were expected to be near 1 if the temporal congruence was preserved [27,30]. We compared the I/E time ratios in the no tool and with tool conditions using the right and left hands using t-tests. All statistical analyses were performed using the JSTAT software for Windows (Nankodo Corporation, Bunkyou, Japan). The motor execution and imagination times during writing are shown in Table 1. The degree of temporal uncoupling was reflected in high I/E time ratios in both the no tool and with tool conditions with the right hand (mean ± standard error: 1.33 ± 0.05 and 1.23 ± 0.04) (Figure 2). The temporal congruence between the two conditions was reflected by I/E time ratios near 1 in the no tool and with tool conditions using the left hand (1.06 ± 0.04 and 1.03 ± 0.04) (Figure 3). Specifically, the I/E time ratios in the with tool condition were significantly lower than those in the no tool condition with the right hand (t = 3.472, p = 0.001), while there were no significant differences between with tool and no tool conditions with the left hand (t = 1.963, p = 0.056). Figure 2. Mean duration of the imagination/execution time (I/E) ratios of the right hand. Similar duration during both conditions (temporal equivalence), yielding an I/E time ratio near 1. The dotted lines and error bars indicate a temporal congruence of 1 to 1 and 1 standard error. Figure 3. Mean duration of the imagination/execution time (I/E) ratios of the left hand. Table 1. Motor execution and imagination times during writing. Values: mean ± standard error. This is one of the first MC studies to assess differences in I/E time ratios during motor imagery while holding a routinely used tool in healthy adults. We used MC to record I/E time ratios during a writing imagery task in right-handed subjects in either with tool or no tool condition. 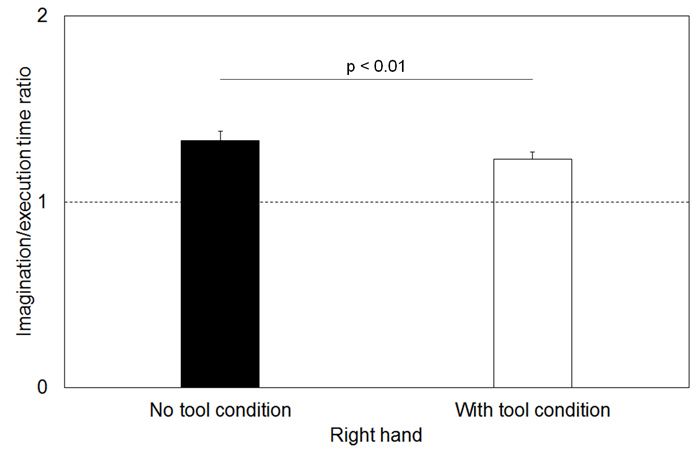 The I/E time ratios in the with tool condition were significantly lower than those in the no tool condition when the task was performed with the dominant right hand. 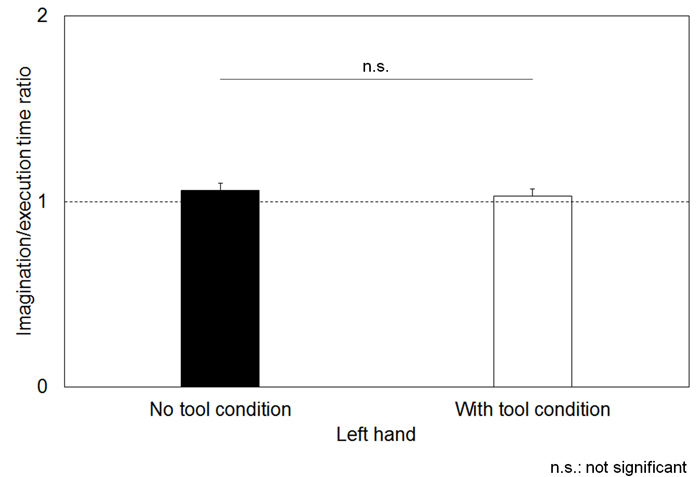 When the same tasks were performed with the left hand, there were no significant differences between with tool and no tool conditions. The I/E time ratios in the with tool condition were significantly lower than those in the no tool condition when using the right hand because the imagination time was similar to the execution time. Preliminary research demonstrated that the image of a tool in use had an influence on the motor imagery [31,32]. In the participants that held a pen in the with tool condition, we suggest that the motor imagery became clearer as a result of the sensory information gathered from holding the tool. Consequently, a body schema was generated similar to that caused by actual writing, and therefore, the imagination time neared the actual writing time compared with the no tool condition. Matsuo et al. 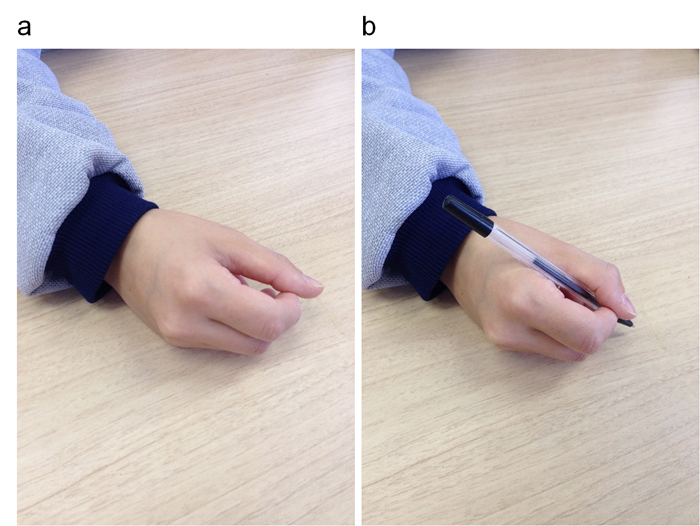 compared the duration of imagined and executed writing tasks using dominant and non-dominant hands . The duration of the executed and imagined writing tasks was longer with the non-dominant hand than with the dominant hand. This result was similar to our results. They suggested that not only motor imagination but also visual imagination affected the extension in the I/E time ratios during automated writing imagination . We suggest that movements of the upper extremity, such as reaching or operation, tend to influence visual function. There were no significant differences in the I/E time ratios when subjects performed the same imagery task using their left hands in the no tool and with tool conditions; thus, it appears that the level of proficiency of the movement may have influenced our results. Fourkas et al. reported that in a motor imagery task of playing tennis, excitatory augmentation of the corticospinal tract occurred with experienced tennis players but not with beginners . They also reported that the experienced tennis players did not experience corticospinal tract reinforcement for other movements in which they were not proficient . Our and similar studies indicate that holding a tool can effectively conjure the image of a movement that has already been mastered using the same tool; however, the influence of holding the tool has little impact on motor imagery when the executed movement is unfamiliar. Motor imagery tasks chosen to augment rehabilitation and recovery from motor deficits must be of movements that were already automated and proficient on the side of the injury. MC has a clear advantage of being a simple and safe method that requires no strict motion restriction [26,27]. MC can be used with subjects in a sitting or standing position or an activity during rehabilitation that is widely practiced in a great variety of environments. A possible relationship between MC and neuroimaging studies is required to investigate activation over a wider variety of brain regions. Further examination is also warranted to evaluate the effectiveness of this finding in people with disabilities and/or in the elderly. The authors would like to thank Kotaro Takeda, Fujita Memorial Nanakuri Institute, and Fujita Health University for the data analysis software. Tsubasa Oikawa performed the experiments and analyzed the data. Daisuke Hirano and Tsubasa Oikawa wrote the initial draft of the manuscript. Hitoshi Maruyama and Takamichi Taniguchi contributed to the design of the study and provided the manuscript critique. The authors declare no conflicts of interest regarding the submission of this manuscript. Jeannerod M (1994) The representing brain: Neural correlates of motor intention and imagery. Behav Brain Sci 17: 187–245. Matsuo A, Morioka S, Hiyamizu M, Shomoto K, Motomura N (2006) Temporal congruence of motor imagery in young subjects. Japanese Journal of Neuropsychology 22: 153–156. ©2016 Oikawa T.This is an open-access article distributed under the terms of the Creative Commons Attribution License, which permits unrestricted use, distribution, and reproduction in any medium, provided the original author and source are credited. NishinasunoMarronnierVisiting Nursing Station, 537-3 Iguchi, Nasushiobara, Tochigi 329-2763, Japan, Tel: +81-287-37-6322; Fax: +81-287-39-3305.